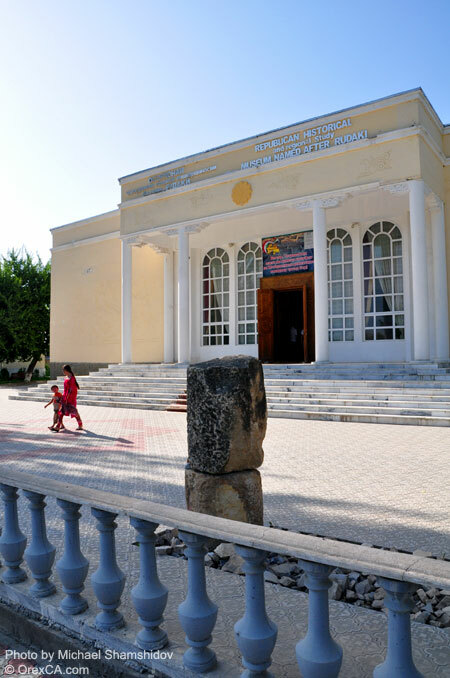 Republican History and Regional Study Museum named after A. Rudaki was built in 1958 in accordance with the Resolution of the Government of the Tajik SSR in honour of 1100 birth jubilee of Abuabdulloh Rudaki - the founder of the Tajik-Persian classic literature. The building was specially constructed for this museum by architect Alexander Ivanovich Makukha, and the facade was decorated by architect Yulia Borisovna Gremyachinskaya. The entrance doors are the work of Barotbekov Yuldoshbek - Honoured art worker of the Tajik SSR. The window and door alabaster carvings were made by brothers Assadovs. The museum facade and its halls were reconstructed in 2008 in honour of A. Rudaki's 1150 birth jubilee. The museum has 8 exhibition halls and 3 departments. 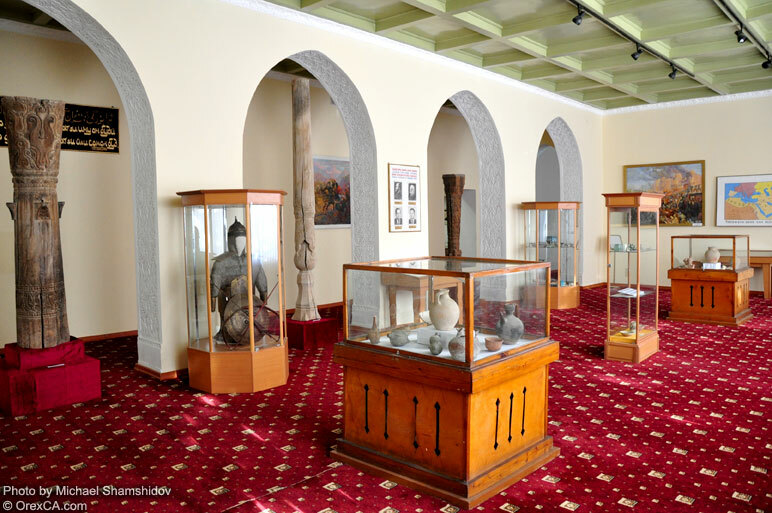 In the exhibition halls there are exhibits reflecting archaeology, nature, history, culture, mode of life, traditions and customs of peoples of Tajikistan. There is also a hall about the life and activities of A. Rudaki - founder of the Tajik-Persian classic literature. The exhibits of the first hall are about history and culture of Ancient Sarasm. These finds show about development of farming and city building culture 5500 years ago. The Ancient Sarasm is situated 15 km to the west of Pendjikent. The large territory of the Sarasm settlement is about 100 hectares. In 1976 A.Tailonov - an inhabitant of the village of Avzali found a bronze axe, and the excavations began in 1977 under the leadership of Professor A.Issoki. Construction of houses and finds show that the settlement existed more than 1500 years beginning in the 4th millennium BC until the middle of the 2nd millennium BC. In the first show-case, finds from the Stone Ages from Qalai. Navruzshah from Qairakkum district are exhibited. 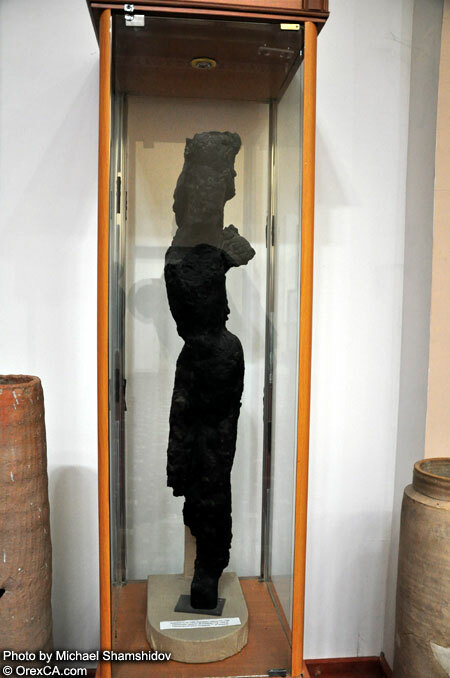 Farther in the show cases finds from the Ancient Sarasm are exhibited. Here we can see arrow heads, bone needles and vessels made of marble. Next to them, bronze artifacts from the 4th millennium BC are exhibited. One of the unique finds in Sarasm is the burial of the Sarasm Queen. In the grave three skeletons have been found. Thousands of beads and various jewelry decorations were discovered on the skeleton and around it. A bronze mirror, a bone awl, two bracelets of sea shell, beads made of lapis lazuli, cornelian, turquoise, silver and gold were among them. Two clay statuettes of the Fertility Goddess were also found. Various ceramic vessels with ornaments which had been made in a pottery-making wheel are exhibited. 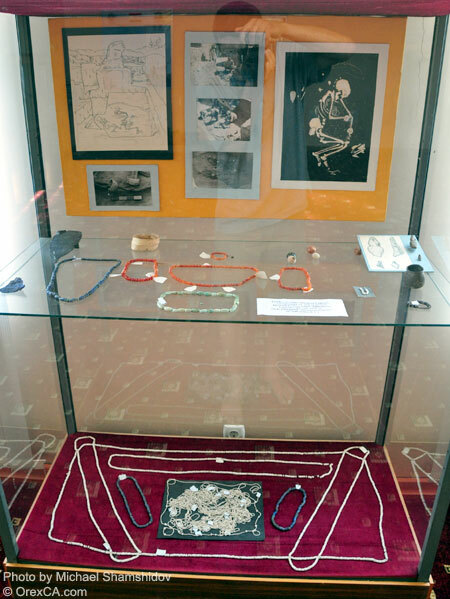 Next to the finds from Sarasm some artifacts from Dashti Qozi, Pendjikent district are exhibited. 29 burials, two tomb stones on the graves have also been found. Jugs, ladies' decorations were discovered in the graves. One can find out the time of burials of the Arian Zoroastrians by this method. Other finds were discovered from burials of Zardcha-Khalifa. These artifacts date from the 2nd century BC. Artifacts from Araktau and Tolkhar settlements in the Shahrtuz district are richly exhibited in the museum. A collection of ladies' decorations like: beads, bracelets, ear rings, rings in the shape of miniature jugs with golden handles, bracelets the edges of which are decorated with little heads of snakes are of great interest. These artifacts date back from the 2nd and 1st centuries BC. At the end of the show case artifacts from the Sarasm burials are exhibited which date back from the 2nd-1st centuries BC. We can see here a metal knife, a sword, arrow heads and details of a belt. The exhibits of the second hall are about history of Ancient Pendjikent 5th-8th centuries AD. Ancient Pendjikent is situated 1,5 km south-east of modern city. In 1932 herdsman Juraali found a basket with documents in the Mugh Mountains - 80 km. from Pendjikent. The documents tell us about history of Ancient Soghdian Government. The documents had been written in the Soghdian and Arabic languages. In 1946, a group of archaeologists headed by Professor A. Yu. Yakubovski arrived in Pendjikent after finishing the investigation of these documents and excavations of Ancient Pendjikent began. From 1953 to 1954 the expedition was headed by M. M. Dyakonov. From 1955 to 1977 Ancient Pendjikent was investigated by A. M. Belenitski - Doctor of Science History. And from 1977 to 2006 the excavations were headed by Professor B. I. Marshak. Investigations of Ancient Pendjikent gave us a great opportunity to know a lot about early medieval epoch of Soghdiana and Central Asia. In the first show case of the hall samples of Soghdian script from Ancient Pendjikent and the Mugh Mountains are exhibited. We can also see here fragments of cotton fabric, the copy of a bronze stamp with Soghdian inscriptions. Ancient Pendjikent became worldwide famous first of all thanks to wall paintings. The wall paintings were discovered in the Royal Palace, in two temples, in dozens of homes of the city's wealthy people. The scenes of hunting, banqueting, battles, traditions and customs of the Soghdian People are seen on the wall paintings. The wall paintings portraying "Hunting on Horseback", "Banqueting Scene", "Three-Headed Demon" are rather interesting. The copies of wall paintings "Rustamnoma", "The Scene of Lamentation", "Back Gammon Game" can be seen on the walls too. Variety of subjects of Ancient Pendjikent's paintings are incomparably excelled those which are known from other ancient monuments. Wall paintings exhibited in the hall, were discovered in different years. Wall paintings of Ancient Pendjikent are masterpieces of world art and reflect the high culture and artistic mastership of their creators. The second showcase exhibits tell us about monitory circulations in the Soghdian Country of the 5th-8th centuries AD. In connection with impetuous development of internal trade mass production of small change coins began. They cast coins with the names and titles of their "King" on one side and other signs on the other. Ceramic vessels of the 5th-6th centuries are richly exhibited in the exhibition hall. Among finds ceramic vessels, kitchen dishes of various form and size occupy the first position. Large jugs for keeping food products, water carrying jugs, miniature games and etc. were found. In the third and fourth show cases metal artifacts, glass vessels, bone artifacts, various economic-domestic artifacts, ladies' decorations and dressing things (rings, ear rings, bracelets, details of belts) and so on are exhibited. In late 7th and 8th centuries Central Asia was conquered by Arabs invaders. Pendjikent was a part of Soghdian State. It was also besieged by the Arabs in 720-722. Local inhabitants at the head of the last king of Ancient Pendjikent - Devashtich fought against the invaders. This fact is basically testified by the written documents found in the Mugh Mountains. In the result, the settlement was burned and destroyed, and the charred statuettes of dancing girls and ornamental decors of wood show about it. To the left in the centre of the hall some fragments of clay sculptures which were found at the entrance of one of the temples are exhibited. Next to them ossuaries for keeping human bones are exhibited. These ossuaries are destined for keeping human bones and about practicing of Zoroastrianism in Central Asia. The walls of the ossuaries and their covers are decorated with carved ornaments. 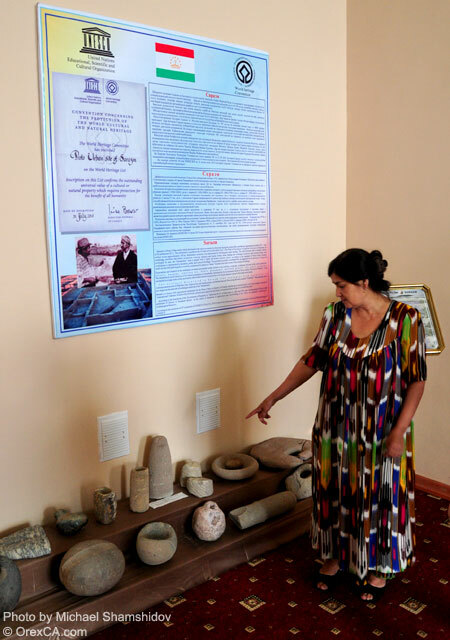 In the last show case some literature about excavations of Sarasm and Ancient Pendjikent in different languages are exhibited. 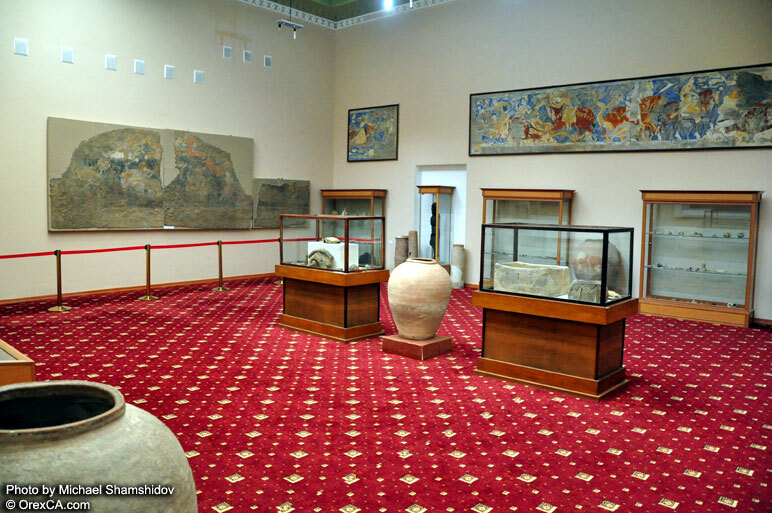 In the third hall of the museum a lot of artifacts are exhibited which tell us about the period when the Somonid State was founded in Central Asia. The founder of this state was Somon-Khudot, who could separate Central Asia from the Arab Khaliphate. The Somonids began to rule in 815 and continued to rule it until 999. One of the representatives of this dynasty was Ismoil Ibn Ahmad who ruled Central Asia from 874 to 907. During his governing this country achieved great success in unifying of Khorasan with Movarounnahr. The Somonid country occupied a large territory-the whole Central Asia, northern areas of Iran and Afghanistan. A. N. Kamelin's pictures "Struggle of Soghdians against Arabs" and "Ismoil Somoni during a Military March" are on the wall here. We can also see the map of the Arab Khaliphate. The epoch of Somonids was the most prospering period in the history of the Tajik People. Just in this period handicraft, literature and science developed. Liberation from Arab Khaliphate's yoke, formation of the Somonid National Centralized Country, wide economic contacts with peoples of the East and other factors favored development of economy and culture of Central Asia. Under the Somonids Tajik People finally won the victory over Arabs and became dominating in business correspondence and in scientific literature. The Tajik literary language obtained the alphabet based on the Arabic script. And poesy began to develop rapidly. It was brightly depicted in works of A. Rudaki - Father of the Tajik and Persian classic literature. The expositions of this hall are ceramic vessels of the period of the Somonids: clay lamps, jugs and various other vessels. In the centre we can see coins of the 9th-10th centuries. Every ruler minted coins in connection with sharp growth of trade. Glass vessels which show about development of glassmaking art are also exhibited. As a centralized country the Somonid rulers had their governmental structure which consisted of ten devons (ministries). The Somonid Amirs were the head of state and controlled the devon's activity and other administrative, political and economic enterprises. In the Somonid period science and literature prospered rapidly. At that prosperous period great masters of poetry such as: A. Rudaki, Ibn Sino, A. Beruni lived and created their literary and scientific works at the court of Somonids. More than 150 manuscripts are kept at museum's reserves. 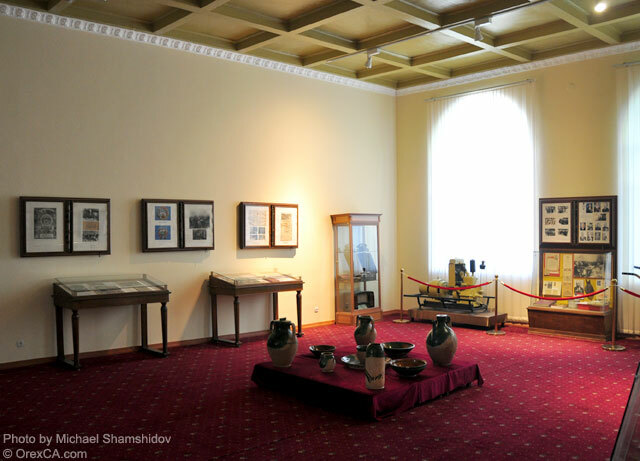 A. Bedil's manuscripts, works of Davlatshohi Samarkandi, Shamsi Tabrezi's collection works, the Koran and History of Tabari are exhibited in the hall. All these books show about development of calligraphic art of peoples of Central Asia. Some arms, a soldier's armour, an arrow and a bow are exhibited here too. They date back from the Medieval Period. Wood carving art was developed from ancient times. Various wooden columns of the 9th-10th centuries are exhibited in this hall. The columns were brought from the villages of Kurut and Urmetan of the Aini district. The variety of ornaments of the columns is the testimony of their creator's skill. Various designs: as vegetative and geometrical designs are carved on the columns. The epoch of Somonids was widely studied by prominent Soviet scholars Bobojon Ghaffurov, V.V.Bartold, A.A.Semyonov and N.Negmatov. Their works are exhibited in this show case. In the last show case ceramic and irrigational vessels, clay lamps, tiles of clay and stone with carved ornaments of the 14th-15th centuries are exhibited. Side by side with other halls there is a hall dedicated to A. Rudaki - the Founder of the Tajik and Persian classic literature. A.Rudaki was born in 858 in the village of Panjrud. He spent hid childhood and youth in his home village. He spent most part of his life in Bukhara at the court of Somonids. When lsmoil Somoni took control, and the Somonid Centralized State was strengthening, Rudaki left for Bukhara. In this period Rudaki's prestige and fame was so great that the Amir and his vezir Bal'ami acted as Rudaki's patron. A. Rudaki wrote his wonderful works in the world of poesy. He gave a powerful impulse in the development of literature and formation of poetical forms. Rudaki was the "symbol of proud of the dynasty of Somonids". Abuabdulloh Rudaki-the outstanding master of word was unanimously acknowledged as the pioneer of poesy in Tajik and Pharsi and the proud of peoples of the Orient. His contemporaries and successors called him "Ustod (Teacher) of Poets of the World" expressing their enthusiasm and proud to him. His works are rich with ghazels, rubai and poems. In his ghazels and poems A. Rudaki glorified freedom, love towards motherland, friendship, truth and justice. At the present time only some extracts from his qasidas and poems as "Complaint of Oldness", "Wine's Mother", Kalila and Dimna", "Sindbodnoma" are preserved. At the end of his life Rudaki returned to his home village and died in 941, when he was 83 years old. In 1940 in accordance with Sadreddin Aini's initiative scientific investigation of Rudaki's life and activities began. In 1956 anthropologic investigations in the village of Panjrud were started. Scientist-anthropologist M. Gerasimov, archaeologist A. Ranov, local study specialist R. Mahmudov and folklore specialist R. Amonov were members of the expedition. In the result of this expedition Rudaki's portrait was made. In October 1955 a resolution on celebration of A. Rudaki's birth jubilee was issued on the base of decision of Central Committee of the Communist Party and the Council of Ministers of the Tajik SSR. In 1958 UNESCO issued a resolution on celebration of A. Rudaki's 1100th birth jubilee. Representatives of not only republics of the Soviet Union but also representatives of Iran, India, Afghanistan, Arabia, Turkey, Korea, African Continent, Vietnam, France, England, Germany and other nations took part in jubilee celebrations. On the wall of this hall photographs and documents showing the activity of the anthropological expedition in the village of Panjrud and celebration of the jubilee in 1958 in Pendjikent and in Panjrud are exhibited. Farther we can see pictures from the film "The Fate of the Poet". The film was produced at the Tajikfilm Studios in 1960 and in 1961 it was awarded the prize "Golden Eagle" at the Cairo film festival. Some presents which were received by the museum in honour of 1100th birth jubilee of the great poet are exhibited in this hall. A.Rudaki's sculpture is the present made by Fuad Abdurahmonov - Azerbaijanian sculptor. Here we can see its copy, its original is in Dushanbe-capital city of Tajikistan. The carpet from the carpet making factory in Kairaqqum, Suzanne embroidered by Russian painter Lissikova are on display in this hall too. In 2007 on the initiative of E. Rahmon - President of Tajikistan celebration of A. Rudaki's 1150th birth jubilee was proclaimed. 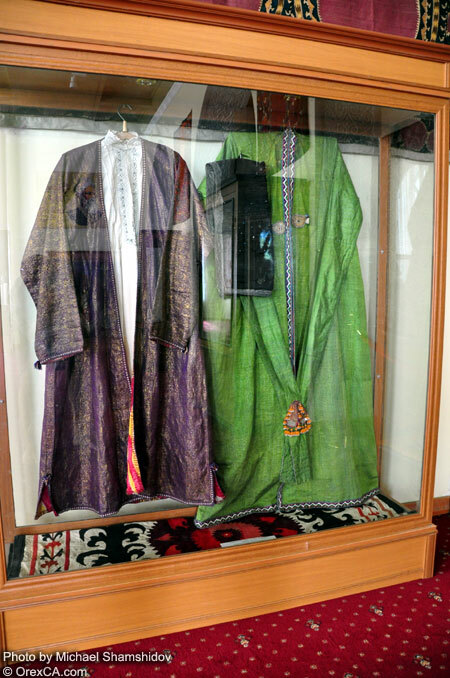 In September 2008 all Tajik people of the world celebrated 1150th birth jubilee of the poet and some presents were gifted to the museum and they are exhibited in the centre of the hall. 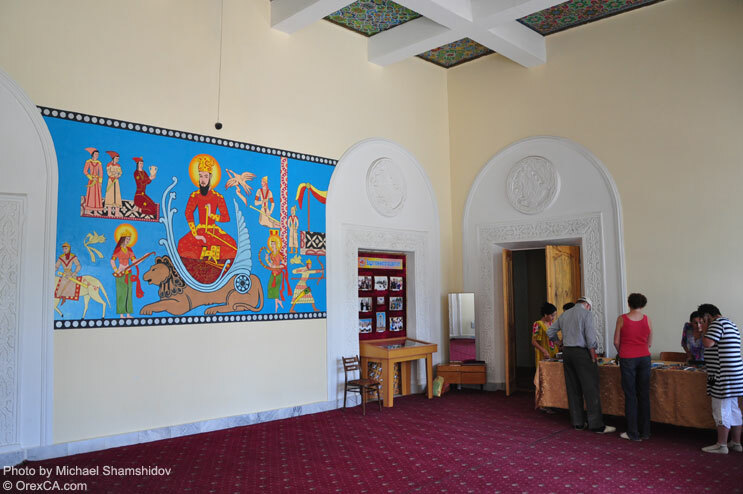 On the wall of this hall Karomatullo Ghayur - People's Painter of Tajikistan's picture "A. Rudaki. Kundal" is on display. It was presented to the museum in honour of the poet's 1150th birth jubilee. Susani is embroidery work by Nikonova and Lissikova. On the wall the pictures by A. Serebryanski "Returning Home" and by I. Lissikova "A. Rudaki" are exhibited. There are some pictures of the opera "A. Rudaki" which was staged at the Tajik State Opera and Ballet House named after S. Aini and the play "Rudaki" performed on the stage of the Tajik State Drama Theatre named after A. Lohuti are on this wall. The wooden panel with the portrait of Rudaki carved by the hands of the Tajik master S. Nuriddinov can be seen. Presents gifted by Iranian scholar Parviz Notili Khonlari in honour of Rudaki's 1100th birth jubilee and other presents as a jubilee medal and books received by the museum in honour of Rudaki's 1150th birth jubilee are exhibited in the centre of the hall. The exhibits of the next hall introduce us with ethnography of the Tajik People. Clothes, embroidery decorations, dishes of copper and bronze and wooden artifacts are among the exhibits of the hall. In the first show cases we can see clothes of the 19th and early 20th centuries. Here samples of ladies' clothes are exhibited. There is a dress made of different silk and cotton cloth among them. In the other show case, samples of men's clothes: gowns, a shirt, a turban of various colour, leather trousers, belts with decorations and leather shoes are exhibited. In the other show case on the left engraved jugs and teapots made of copper and bronze are exhibited. We can also see two dishes made of marble with Persian inscription down here. On the right we can see ladies' jewelry decorations which are different in their forms and ornaments, their designs are not alike with each other. Here we can see forehead jewelry decorations: "Qoshi Tillo", "Takhtachabargak", chest jewelry decorations: "Tavq", "Haikal", shoulder and nose jewelry decorations: "Bozuband", "Pupak", as well as ear rings, bracelets, beads made of coral are exhibited. Mainly these jewelry decorations are made of high quality silver with incrustation of bronze, gold, coral, turquoise, cornelian, agate, amber, lazuli and coins. These jewelry decorations were usually worn by girls during solemn and happy days, as well as on the day of their weddings. National room with traditional gahvora (cradle), kurpacha (mattress), pillows and dastarkhan (table-cloth) made of pieces of cloth and copper dishes are exhibited here. Next to them there are also artifacts like a shuttle and a spindle are exhibited. There is a show case at the end of the corridor where wooden artifacts like: a lock, dishes, stamps for dying cloth in different colour, a support for books and a pencil-box are exhibited. We can also see samples of cloth with designs. In the centre a saddle with horses' attire is exhibited. The saddle is covered with ivory and the attire is made of bronze and is decorated with semi-precious stones and shells. These artifacts date back from the 19th century. Next to other expositions in the ethnologic department t embroidery art occupies an important position. The museum possession is rich with various wonderful suzanne of the 19th and early 20th centuries. They are embroidered on different cloth with silk and cotton thread. Newly weds' room is decorated with suzanne and this traditional ritual is preserved to the present days. According to their embroidery methods and decoration some suzanne don't yield to good carpets. The designs of embroidery are different, for example "Lolagul"- a large rosette surrounded by plant flight, "Tilloduzi"-gold thread embroidery and so on. 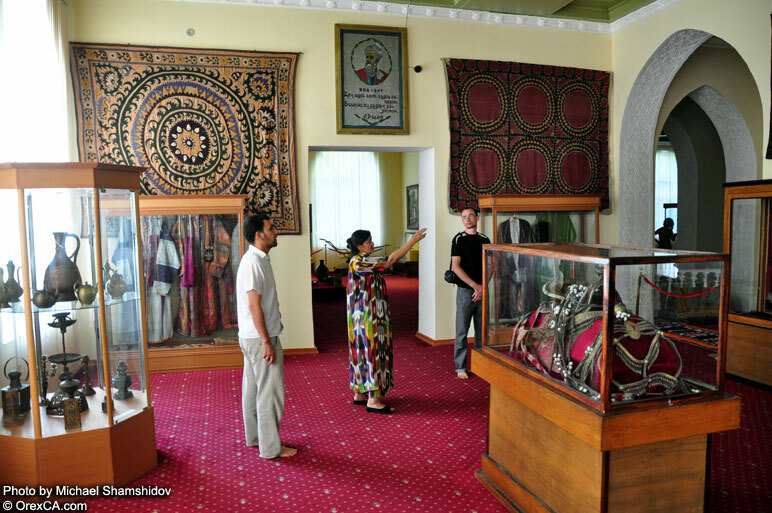 The expositions exhibited in the ethnography hall show about the high culture of the Tajik people and traditions of our ancestors. 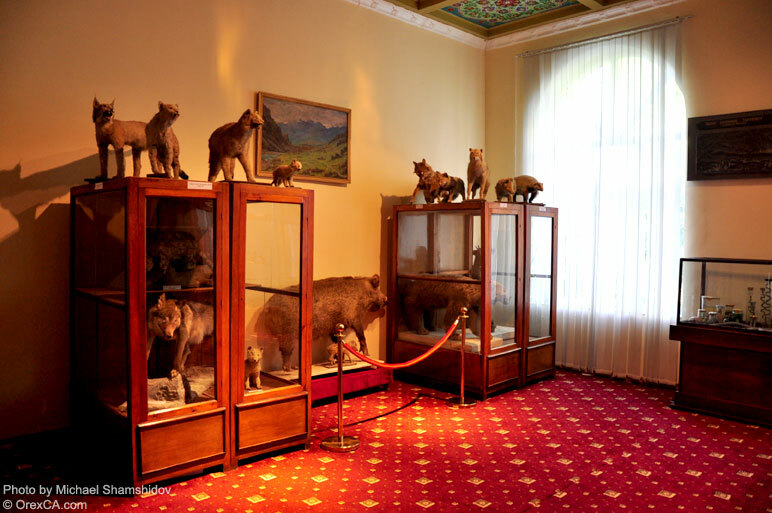 The exhibits of this hall tell us about establishment of Soviet Power in Tajikistan, formation of the first collective and state farms, years of the Great Patriotic War and history of the Tajik People before independence of the republic. On the wall you can see two maps: Central Asia in late 19th and early 20th centuries. Late in the 19th and early in the 20th centuries the territory of modern Tajikistan was a part of Bukhara Emirate. The Soviet Power was established in Central Asia in the 1920s. The first All-Tajik Constitutive Congress of Soviets was held in 1926. This Congress became the turning point in the history of the Tajik People. It legally set the borders of the republic and gave the start to peaceful socialist construction. After the resolution of the second session of Central Executive Committee of the USSR was issued, Tajikistan became a part of the USSR as the seventh Soviet Socialist Republic. Photographs and documents telling about the first years of the Soviet Power in Tajikistan are exhibited in the first show cases. Here we can see some photos of delegations' of the First All-Tajik Constitutive Congress of Soviets in 1926. Photos of representatives of the Communist Party and Soviet Government are exhibited here as well. In the late 1920s and in early 1930s the first collective farms were formed both in Central Asia and in Tajikistan. A plough is exhibited here which was the first agricultural machinery in the collective farm called "The Gate of the Red Orient". A diesel engine and some documents show about the first years of electrification in Tajikistan. Farther we can see photographs and documents showing that the Tajik People's sons and daughters fought on the fronts of the Great Patriotic War. 260 thousand people from Tajikistan fought in this war. 53 of them were awarded the title of the Hero of the Soviet Union. 15 of them were decorated with the order of "Slava" and more than 60 thousand Tajik soldiers were decorated with other orders and medals for showing courage and heroism. This turnstile is about two of our heroes from this city of Pendjikent. They are I.P.Razin and M.Panfilov. During the Soviet period Tajikistan's agriculture developed fast. The people of the republic were engaged in fanning: tobacco growing, cotton growing, in gardening and vegetable growing, live-stock breeding and silk worm breeding. The Program of the Government of the USSR in the field of agriculture was successfully carried out. Side by side with other exhibits samples of ceramic vessels, applied art as skull caps, forehead decorations and embroidery artifacts are exhibited. Some prizes won by Tajik sportsmen in international competitions are exhibited at the end of this hall. The exhibits of this hall tell us about Independence of Tajikistan. Following the example of other Central Asian republics, in September 1991 Tajikistan proclaimed its independence. Tajikistan was acknowledged as an independent country by the UN on the 2nd of March 1992. The 16th Session of Supreme Soviet of the Tajik SSR held in Khujand in November 1992 proved that among parliament members there were healthy and powerful forces who were capable to oppose any adventure. People's deputies of the Supreme Soviet of the Tajik SSR elected the new political leadership at the head of E. Rahmonov at the 16th session. Just only he could move forward a comprehensive program of pulling the country out of political, economic, cultural and moral crisis as the head of state. In this show case we can see photographs, documents, literature about the history of the 16th Session of the Supreme Soviet of the Tajik SSR. The country was renamed Republic of Tajikistan. In 1994 E. Rahmonov was elected President of Tajikistan by open and universal ballot. The Constitution of Republic of Tajikistan was adopted that year. On the wall you can see portraits of heroes of Tajikistan S. Aini and B. Ghaffurov. In the next show case there are photographs about 1100th anniversary of the Somonid State. During years of independence Tajikistan's economy has developed fast. There are more than 500 industrial enterprises, factories and plants in Tajikistan. One of them is the "Zarafshon" Joint Venture, which was founded on the base of gold extracting enterprise. Mountains of the Zarafshon Valley are rich with invaluable sources of natural wealth. The Maghiyan Geologic Investigation Expedition has been searching natural wealth since 1948. 237 people work at the expedition at the present time. As a whole there are 328 deposits of minerals which have a great significance. The "Zarafshon" Joint Venture and "Lada Marmar" enterprises are working on the base of the Maghiyan Geologic Investigation Expedition. On the turnstile we can see photographs of workers of these enterprises. Down here two models of gold brick, samples of minerals and overalls of a worker are exhibited. There is also a show case where samples of marble goods are on display. The city's educational establishments and village schools are well organized and provided with new equipments. There are 136 schools, a Teachers' Training Institute, Medical and Teachers' Training Colleges, a Technical Lyceum, two musical schools and three High School-Lyceums in the city and district. Two Honoured Educationalists of Republic of Tajikistan, two Honoured Teachers of Tajikistan, one bearer of the order "Slava", one bearer of the medal "For Outstanding Service" and 272 bearers of "Excellent Teacher of Tajikistan" work in the district. In the show case we can see their photos and some documents about them. The other show case is about modern medical service. A program of universal health service is carried out in the health service sphere. 127 medical enterprises are functioning in Pendjikent district. The newest medical facilities are used in these enterprises. Modern musical instruments and some books about "Shashmaqom" are exhibited in the centre of the hall. At the end of the hall you can see the portrait of E. Rahmon-President of Tajikistan and next to it national emblem and flag of Tajikistan. The author of the portrait is Karomatullo Ghayur - Honoured Painter of Tajikistan. In the corridor on the wall you can see photographs which tell us about meetings of the Tajik President with Presidents of other countries of the world and the President of Tajikistan's visit to Pendjikent district. Tajikistan is famous in the world for its unique nature, mountain streams, tall mountain ranges, transparent mountain lakes. The climate is continental. The hottest place in Tajikistan is Aivaj (Shahrtuz district) and the coldest place is Bulunkul (Murghab district). 93 % of Tajikistan's territory is mountainous. On the wall you can see the relief map of the Zarafshon Valley. The highest mountain peaks are among the Tien Shan, the Pamirs, the Hissar and the Alai mountain ranges. Tajikistan has 947 rivers. The largest of them are: the Syr-Darya (2212 km), the Panj (921 km), the Zarafshon (781 km), the Vakhsh (524 km). Tajikistan's nature is rich with medicinal herbs. 150 kinds of herbs, 50 kinds of honey bearing flowers, 100 kinds of food plants and 120 kinds of ether-bearing plants grow here. Animals' world of Tajikistan is rich and various. Wild animals from the family of rodents are exhibited in this show case. Wild qamish cats, snow leopards, wild bores, bears, foxes, jackals, mountain goats are among them. Bears are beast prey mammals. They live in thick dense forests and eat fruits and forest berries. Snow leopards are large beasts living high up in the mountains. They are strong and adroit. They are put down in the nature's Red Book. Representatives of the Alp meadows are large mountain sheep-arkhar-variety of mountain goats. Martens, musk rats, porcupines, tortoises, hedgehogs, weasels and others are exhibited here. 365 kinds of wild birds live in Tajikistan as well. More than 200 kinds of birds live here in the valley. They can be found in the mountains and steppes, gardens and massive forests of Pendjikent. In other show cases in this hall some other kinds of birds as pelicans-birds of passage, black kites, the family of hawks and owls, black and white storks, cranes, bustards and birds-mammals are on display. Here you can also see pheasants, partridges, and sea gulls. An eagle and a hawk can be seen on the ceiling. In the other show case you can see the family of reptiles. They are snakes: a cobra, a viper, some kinds of fish, phalanges, Turkistan big-nosed agama. Large lizards, steppe tortoise and representatives of other reptiles are found at the mountain feet steppes. Two small pictures with the views of Pendjikent are on display at the end.